In 4 quart braiser or dutch oven, saute the onion in olive oil on medium heat, about 5 minutes or until translucent. Add the mushrooms, zucchini, garlic, tarragon, thyme, salt and pepper and saute for another 5 minutes. Add the carrots, lentils and broth. Cover and bring to a boil. 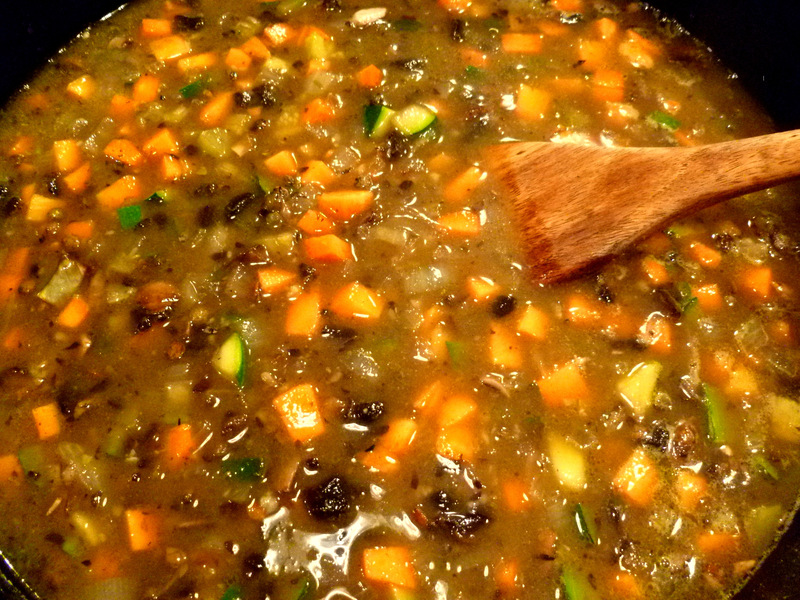 Once boiling, reduce heat to a low simmer and simmer for about 40-50 mintures or until lentils and carrots are tender. Stir occasionally and if needed, add a little more broth. The end result should be thickened with most of the broth absorbed. When carrots and lentils are tender, add the worcestershire sauce, peas and corn. Turn off heat and let sit for 10 minutes, covered, for flavors to meld. Taste for salt. Preheat broiler. Place ramikans on baking sheet. Scoop mixture into ramikans about 1/2 full. Add the cauli-pots on top leaving a little room, about 1/3 from the top. Place under broiler for 6-10 minutes or until potatoes start to brown a little. Place potatoes in large pot filled with hot water making sure there is about 4 inches of extra water for cauliflower. Bring potatoes to a boil. Once boiling, add the cauliflower and lower heat to a simmer. Simmer for about 15 minutes or until everything is tender. Drain in a colander. Return to the pot or put in a mixer and mash or blend until well combined. Add the olive oil, broth, salt and pepper. Add more broth as needed. See directions for Shepherds Pie for assembling. All items added together getting ready to simmer down. Looks very good. My wife loves Shepherd’s pie, but not the calories. Thanks for posting this alternative! I just posted the calories in the footnotes as well, just in case she wants to know. There is no fat in the Shepherds pie, and just 3.5 grams in the caulipots. Enjoy! Ooh, this looks delicious! 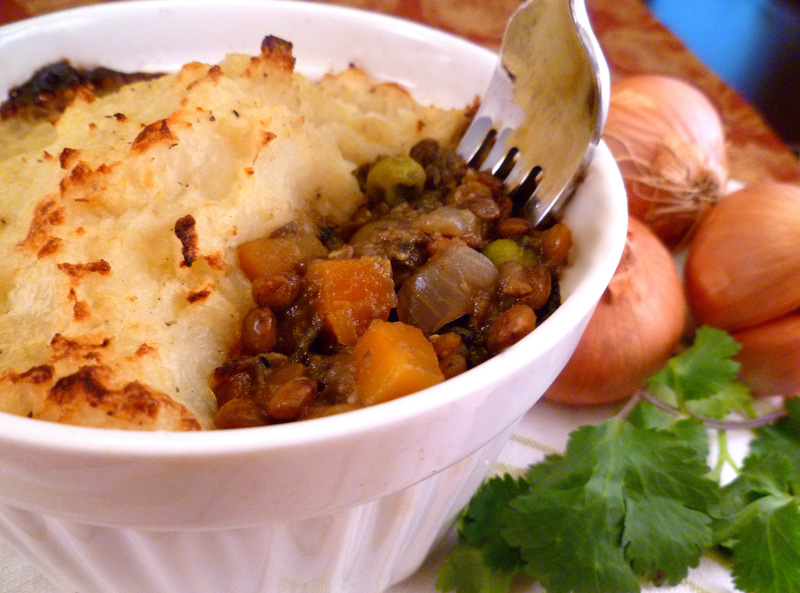 I just posted a recipe for vegetarian cottage pie recently which is similar, but more lentil-based. I like the sounds of all the veggies you used. I’ll have to check out your vegetarian cottage pie! Sounds delish and I love lentils! Let me know what you think of it. Enjoy! Omg. My boyfriend recently surprised me with delicious vegan pot pie with golden beets. I’ll have to return the favor with this recipe! Ohh! That vegan potpie with golden beets sounds delightful too!